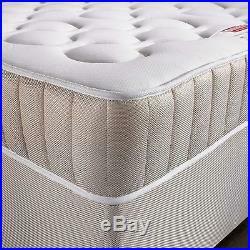 COSY 25CM 10 MEMORY FOAM SPRUNG MATTRESS 3FT SINGLE 4FT6 DOUBLE 5FT KING. 01924 45 88 55. MADE IN THE UK!!!!!!!!!! KW, IV, AB, PH, DD, PA, TR, PL, TQ, EX, DT, LD. IF ORDERED BEFORE 1pm. 3FT SINGLE, DOUBLE 4FT6 5 FT MEMORYFOAM MATTRESS. A LAYER OF 40KG/M3 DENSITY MEMORY FOAM. 13.5 OPEN COIL BONNEL SPRING FOR EXTRA SUPPORT. 25CM (10approx) OVERALL MATTRESS DEPTH. (DIRECT FROM THE MANUFACTURES CUTTING OUT THE MIDDLE MAN). PLEASE NOTE THERE ARE VARIOUS QUILTING PATTERNS AND THEY MAY VARY. Benefits to your body using memory foam. HEAD support of the head will encourage the neck muscles to relax and prevent tension headaches. BACK Correct alignment of the spine lowers back pain. PELVIS & HIPS The foam moulds to the contours of the body reducing the risk of swollen hip joints or an aching pelvic area. LOWER LEG & HEELS Circulatory problems which cause swollen calves or feet is prevented by spreading pressure, chaffing and soreness is also avoided. ALLERGY SUFFERERS Superb for people with Asthma as the foam is Anti-microbial and dust mite preventative. Featuring a generous memory foam sleep surface. On top of a open coil spring unit. This premium quality mattress has a quilted top. Standard uk sizes 3ft 4ft6 and 5ft. High density memory foam. Contours to your body’s natural shape. Full head to toe anatomical support. Relieves pressure points across the body. Promotes good blood circulation. Quilted mattress in a Quality Cover. Suitable for any type of standard size bed base. Fully compliant with all UK fire regulations. 13.5 gauge bonnell spring. Wired edge for extra support. A family run business with an aim to deliver and satisfy our customers. UK manufacturers since the early 90’s we have experience in every department of the bedding industry and can suit everybody’s needs. We can do special orders and we go that extra mile for every customer. Here at Bed-World we take great pride in delivering your item safely and on time. If you wish to return unwanted goods, you must notify as soon as possible. If upon assembling there are missing or broken parts, please notify us as soon as possible on 01924 450 444 se we can offer a suitable replacement. Please feel free to contact our free customer helpline on 0800 028 3326 or 01924 450 444 between 9-8PM Monday to Friday or 10-4PM on Saturdays. 4FT SMALL DOUBLE BED/MATTRESS. 4FT SMALL DOULBE MATTRESS. 5FT KING SIZE BED/MATTRESS. 5FT KING SIZE MATTRESS. 6FT SUPER KING BED/MATTRESS. 6FT SUPER KING SIZE MATTRESS. The item “COSY 25CM 10 MEMORY FOAM SPRUNG MATTRESS 3FT SINGLE 4FT6 DOUBLE 5FT KING” is in sale since Wednesday, November 06, 2013. This item is in the category “Home, Furniture & DIY\Furniture\Beds & Mattresses\Mattresses”. The seller is “bed-world” and is located in london. This item can be shipped to United Kingdom.